Bright, colorful and fun! That’s the look and feel of the Sweet Candy Themed Birthday Party. Think rainbow colors, accented with hot pink, lime green, neon yellow, lavender, turquoise, black and white. 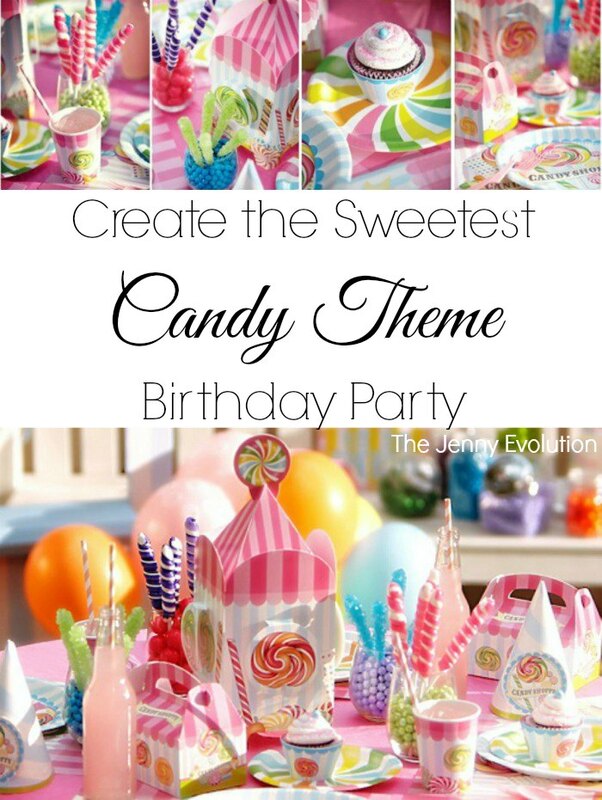 Hands down — this party will be the sweetest candy themed birthday ever! Adding lots of colorful balloons all around the party zone. For inspiration, picture Willy Wonka’s chocolate factory, Candy Land or even the game app Candy Crush. There are tons of fun birthday supplies to fill even the biggest sweet tooth! This post contains affiliate links. These Sweet Shoppe party supplies incorporates all these colors in their collection of brightly-colored rock candy sticks, multi-colored Whirly Pops, Gumball assortments, lollipops and more. They’ve also got a fun, candy-themed personalized birthday banner that will really make a child’s special day sweet. While most kids are convinced that they could survive on candy alone, it’s a good idea to have an array of healthier foods to balance out all the sugar (although, there will be plenty of sugar involved in a Candy Shoppe Party). To sneak in some more substantial food, make it fun! You can include make-your-own-mini-pizzas or cook up small-portion hamburgers. Plus, have a veggie plate loaded with multicolored veggies and fruit (carrots, red and yellow bell peppers, green beans, purple cauliflower, strawberries, blueberries, etc.). On the sweeter side, the options are almost endless! You could arrange a rainbow colored assortment of licorice sticks in cups on a table and have the guests bite off each end and use the licorice as straws! You could pre-frost cupcakes and then let the guests decorate them with everything from jelly beans and Pop Rocks Candy to M&M’s and sprinkles. And you can serve it all on Candy Shoppe dinner plates! What’s a Candy Themed Birthday Party without a fun game of Candy Land? 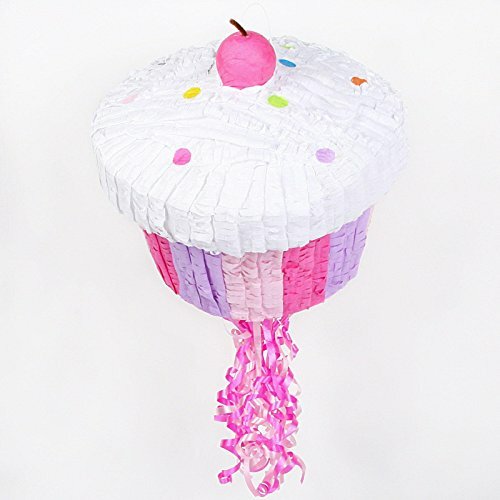 Try other enjoyable games, such as a Giant Cupcake Pinata and an Inflatable Cake Ring Toss Game. Perfect candy-themed favors include cupcake scented nail polish, candy necklaces, ice cream lip balm, and Candy Shoppe tattoos. And you could send each guest home with their very own Candy Shoppe Filled Party Favor Box that includes a candy sticker sheet, candy buttons, a glitter bracelet and more sweet treats! And what better way to say “Thanks for being such a sweet friend,” than with Candy Shoppe Thank-You Notes. WHAT WOULD YOU INCLUDE IN A CANDY SHOPPE PARTY? Oh my goodness what a beautiful birthday party theme. The table looks amazing! I discovered your blog through the linky party. Yeah! So glad you’re joining me and that you like the birthday party tablescape. I love the party decorations! I wish my kids were still little. I loved throwing parties for them. Thank you so much for linking up to Small Victories Sunday Linkup! Honestly, forget the kids. Throw the party for yourself. Ha! What a cute idea for a party. I love this and all the bright colors. I think everyone of all ages would love this. Thank you for sharing at Motivational Monday Link Party. I can’t wait to see what you share this next week too. Have a great weekend! Pinned & shared! Such a cute idea! Thanks for sharing at the party! Hope to see you again soon.